The Low-Noise Quick Release Propellers from DJI are designed to work with either your Mavic Pro or Mavic Pro Platinum quadcopter. The props feature an aerodynamic design that adds noise-control performance to either craft. When used with the Mavic Pro Platinum, up to 4 dB (or 60%) of aircraft noise is lowered during takeoff and landing, and flight time is extended to 30 minutes. Noise reduction and flight time are also enhanced when used with the Mavic Pro, but not to the same degree. The props will work with both Mavic-series quads, but they are not compatible with the Mavic Propeller Cage. Box Dimensions (LxWxH) 4.1 x 2.4 x 0.5"
Low-Noise, Quick Release Propellers for Mavic-Series Quadcopters (Golden, 1 Pair) is rated 3.8 out of 5 by 17. Rated 2 out of 5 by ron from Quality control issues or...? Like a lot of other Mavic Pro owners I was excited to try these new low-noise props and waited a long time for them to be in-stock. When I first removed them from the box I noticed minor surface irregularities on the trailing edge of each one. Almost like slight rippling. Since all six I received were this way I thought it must be normal although my stock props' trailing edges are perfectly straight and uniform. I mounted them on the MP, did an IMU, compass and Gimbal calibration. During first take off immediately noticed the gimbal bouncing up and down harshly. Additionally, the MP was very unsteady while hovering. I did not feel comfortable flying with them so landed and remounted my original props. All the gimbal vibration was gone and steady hovering returned. I was disappointed because there was definitely a noticeable decrease in noise output. Maybe DJI cut corners in quality control in order to rush these to the market. Rated 4 out of 5 by David P. from Not significantly quieter but noticeably so.? Longer though. 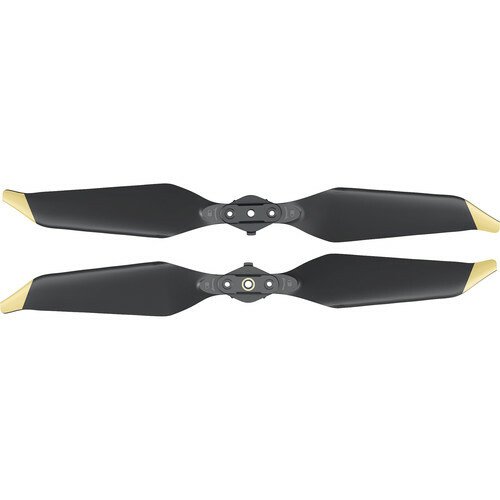 I bought these to try out a quieter blade for my Mavic Pro.? When you install them the first thing you will notice is that the blades come MUCH closer to the body than the original blades.? I was a little worried to tell the truth after installation but they worked fine. The specs say they are about 5DB quieter and I would believe that.? Keep in mind the "swarm of bees" sound is still present just a bit quieter.? Overall I like them but will save them for specific use purposes.? I can not speak to the battery saving as I only flew them just under 1/2 batteries time. If you were looking for "whisper mode" quiet... not here. Rated 3 out of 5 by Jim L from So, so Maybe it's just me, but I don't hear that much of a difference. Since you should carry extras anyway, it's no big deal. Just wouldn't mind it being a little quieter so as to not bother anyone who might be around. Rated 3 out of 5 by Aaron from Quality issues Propellers came with irregularities. Edges were wavy and gimbal shake errors. BH refunded nicely, but just wanted good props. Not sure what is going on with DJI but they are authentic. Rated 5 out of 5 by David from A Winner! I had bought the generic props and felt they worked fine. But after reading reviews, I started to get apprehensive and bought genuine DJI....Wow! Excellent product and they do fly quieter. Totally satisfied! The workmanship and performance was more than I expected. Plus, B&H Photo had the best price.. Result..A Winner! Rated 3 out of 5 by Timothy from "Low-Noise" They work great as propellers but the claim that they are "low-noise" is somewhat misleading. I'm perfectly happy to keep them and use them, especially for the price. I just feel like they are still loud even if they do make less noise than the original propellers, they are not "low-noise"
Rated 4 out of 5 by Andrew from Better Only flew these for a minute.? They're definitely a bit quieter than the original props.? They're a bit thinner, too.? Hopefully they hold up well. Still fit nicely in the DJI bag when all packed up. Price is not bad. Rated 3 out of 5 by Justin from Slight difference but maybe not necessary More than anything these slightly change the sound rather than reducing it so much. That's my opinion anyhow. If you have to order props anyhow, may as well get these, otherwise wait until you need some. How far away would a Mavic Pro with the low-noise propellers have to be in order to not be noticeable on a microphone worn by an on-camera talent? This type of testing has not been done by DJI, but my personal experience it should be around 500 feet.